EXECUTIVE FAMILY NORTH VANCOUVER TOWNHOME FOR SALE! Contact Cal Pye & Michelle Rogers at 604.649.5585 to book a showing! This brand new luxury townhome in the heart of Central Lonsdale offers luxury and lifestyle at exceptional value. This home offers private street level entry, direct access to two car underground parking stalls, plus luxury living over 3 floors. The Central Lonsdale area of North Vancouver is becoming one of the most desirable locations in Greater Vancouver, with its close proximity to the city, and a world of activities right at the doorstep. The North Vancouver property market continues to show positive momentum making this townhome a sound real estate investment in a true growth area. A chef’s delight! This spacious luxury kitchen offers every convenience. 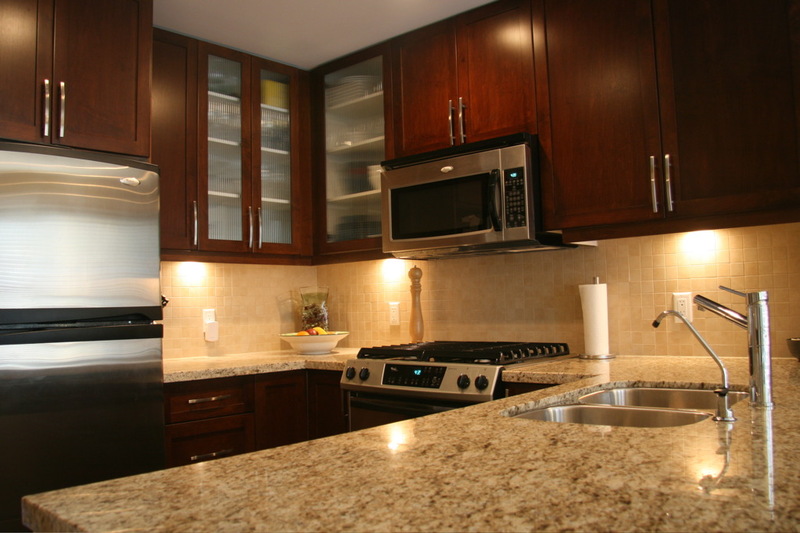 Premium gas range, overhead microwave, stainless steel fridge and ultra-quiet dishwasher. 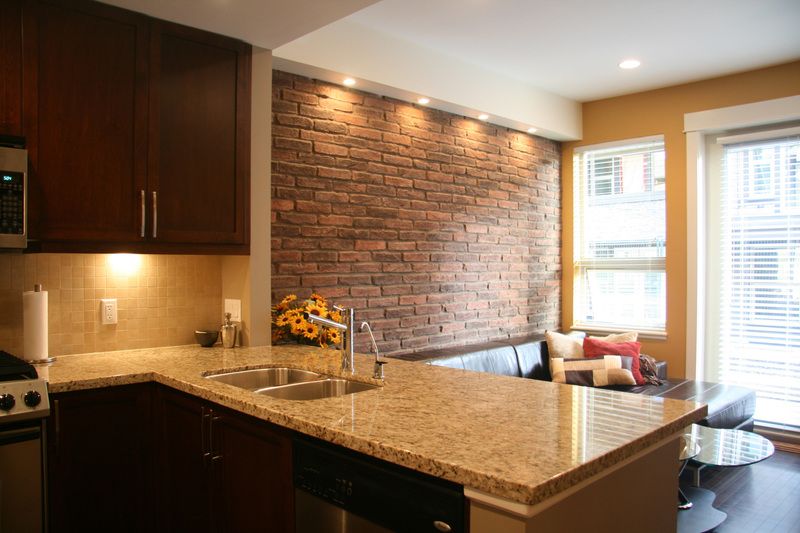 Solid granite counters, undermount sink, built in water filtration, industrial garburator and halogen counter lighting are but few of the conveniences. Plus enjoy the delight of heated solid hardwood floors and beautiful south facing French doors. Quality and luxury abound, from the magnificent fire place to the professionally designed custom lighting this is a townhome at Avondale on St. Andrews above the average. Enjoy flexible living spaces, featuring both a living room and family room - fully wired for surround sound. 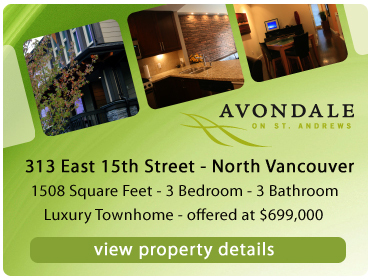 Offering both north and south exposure, French doors, radiant foor heating, 9 feet ceilings, and a vaulted master bedroom - luxury abounds at this North Shore Townhome for Sale at Avondale at St. Andrews in Central Lonsdale real estate market. During construction the owners made numerous custom upgrades to this unique Central Lonsdale townhome including an enormous walk-in luxury closet by California closets and hand layed brick masonary in the family room. 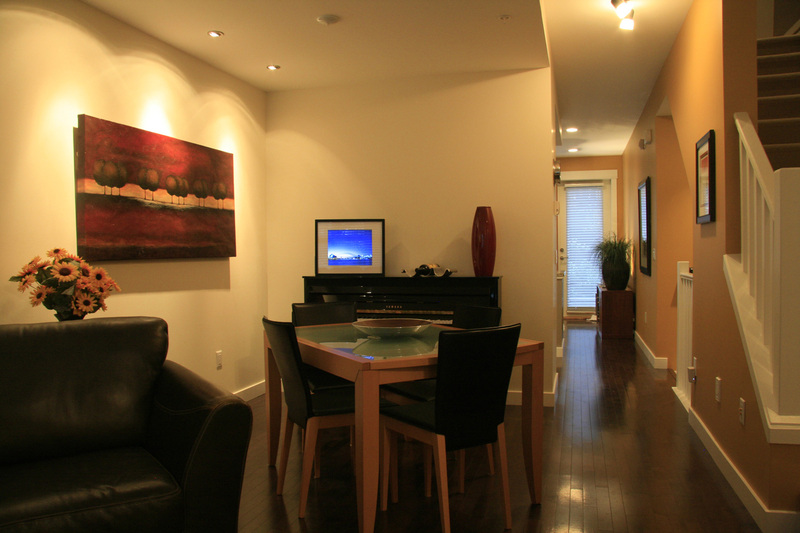 The lighting is fully automated by SmartHome® with dimmers throughout. The main floor and basement features premium real solid hardwood floor that is unique to this Avondale North Vancouver townhome for sale. Offering over 1500 square feet of living space this unique Central Lonsdale townhome floor plan is as flexible as it is spacious. The basement (with bright above ground windows) can be readily used as either a full 3rd bedroom, or a perfect media or games room. The basement also features a full 3rd bathroom, full laundry room, and cavernous storage - plus direct access to the secured underground parking with 2 private stalls. The main floor offers the luxury of separate living and family rooms, plus a centrally located kitchen perfect for entertaining. The south facing patio is ideal for outdoor living with ample room for BBQ and private garden. The upper floor of this North Vancouver family townhome for sale enjoys beautiful views of the North Shore mountains from the spacious master bedroom. 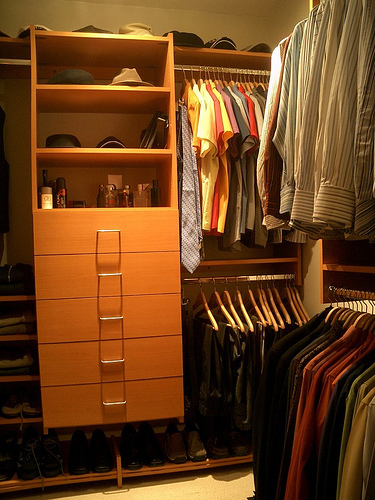 The custom walk-in closet is a central feature as are the 2 full luxury bathrooms offering a walk-in shower and a deep soaker tub. Only a minutes walk from the shops and services of Central Lonsdale in North Vancouver and a short 10km drive to down-town Vancouver makes this Avondale on St. Andrews town home perfect for busy professionals also an ideal family home, with some of the best schools on the North Shore only minutes away. Enjoy a short commute, and an afternoon stroll along Grand Boulevard in a location that is fast becoming a choice location, and a genuine hot-spot in greater Vancouver. Now selling in Central Londsale North Vancouver real estate market, the presale St. Andrews Gardens development is a collection of new luxury townhomes and condos that are centrally located to amenities. Just two short blocks away from Londale Avenue, the North Vancouver pre-construction St. Andrews Gardens townhomes and town houses are a strata complex of just 11 luxury presale Central Londsale suites with floor plans that range from one bedroom, one level townhomes to three bed, 2.5 baths multiple level townhomes. These St. Andrews Gardens homes in Central Lonsdale North Vancouver real estate offerings are now under construction with an expected completion date and move-ins in March 2009. 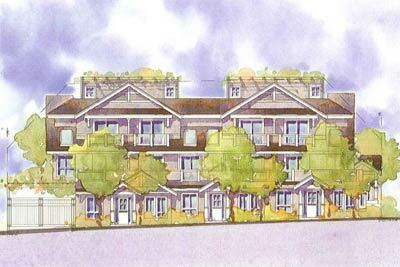 All presale North Vancouver townhomes at St. Andrews Gardens will have the 2-5-10 year new home warranty. The spacious and open floor plans range from eight hundred and three to sixteen hundred and fifty seven square feet approximately. Some of the great and unique features of these pre-sale townhomes at St. Andrews Gardens North Vancouver property include very large rooftop decks with views, multiple balconies and patios, secured underground parking and interior features of engineered hardwood flooring and granite counters. The price range for these pre-construction North Vancouver St. Andrews Gardens townhomes starts at $468,000 for the spacious one bedroom condos and from $699,000 for the three level family executive townhomes. All prices do not include GST. For more information, you should contact Tony at RE/MAX Rossetti Realty by visiting http://www.realestatenorthshore.com/property-2887.php and submitting your interest. Here is a quick list of pre-sale North Shore townhomes and condominiums being offered at the luxury St. Andrews Gardens Central Lonsdale real estate development, just two blocks from Lonsdale Avenue. 280 East 11th Street is a one bedroom plus den and 1.5 bath unit at 896 approximate square footage and priced at a reasonable $468,000. 1117 St. Andrews Avenue North Vancouver townhomes for sale is 1496 square feet in size with 3 beds and 2.5 baths and featured at $699,000 which is the same price point for 1119 St. Andrews Avenue that is 1503 square feet. At $798,000, 1123 St. Andrews Gardens Central Lonsdale townhome is a very spacious 1938 sqft while 1126 St. Andrews Ave is 2041 sq ft at $778,000. Unit 1127 is also over 2000 sf with 3 bedrooms and 2.5 bathrooms and is priced at $788,000 while 1129 St. Andrews Avenue townhouse is 1938 sf at $798,000. The presale St. Andrews Gardens North Vancouver townhomes have already been selling very quickly with 282 Eats 11th Street condo sold (1 + den, 1.5 bath at 895 sf) as well as the townhomes at 1115 and 1121 St. Andrews Gardens which are both roughly over 1500 sf. Pending is 278 E. 11th St, which is the smallest condo home at the pre-construction St. Andrews Gardens North Vancouver townhome development that features 764 sf with 1 bed and 1.5 baths. Most of the three level townhomes in this Central Lonsdale real estate offering have oversized rooftop decks of over 400 sf. Invite the Outdoors Into Your World – The Natural Place to Call Home – Branches on the North Shore. Find the sanctuary amidst the trees. Nestled amongst striking evergreens, the Lynn Valley condo presale development at Branches by Polygon is a collection of contemporary two and three bedroom pre-construction North Shore apartment residences inspired by the spectacular landscape. Distinctive Pacific Northwest and West Coast architecture at the new pre-sales Branches Lynn Valley condos takes its cues from the mountainside setting, while expansive windows and balconies invite nature indoors and create light, airy living spaces. Discover a modern pre-sale North Vancouver home in a Lynn Valley community with all the urban amenities you’re looking for – and all the natural beauty you dream of. Where nature is a way of life. The pre-construction Branches condominium residences by Polygon Homes is part of a friendly North Shore real estate neighbourhood where nature takes centre stage. Whether you love strolling forested paths, relaxing by the ocean, or exploring local parks, you’ll find an outstanding variety of recreation minutes form the front door at your private Branches condo home. And with the revitalization of shops and services in Lynn Valley real estate community, urban conveniences are just steps away from the presale North Vancouver condos at Branches by Polygon. Escape to your scenic retreat and choose a pre-construction North Shore home at Branches in Lynn Valley to experience the natural exhilaration of life in North Vancouver. Branches on the North Shore are now selling. More information about the original marking of Branches Lynn Valley apartments is located here. A special advertisement about the Polygon Branches Condominium development in the Lynn Valley North Vancouver real estate district. Polygon’s Branches in Lynn Valley real estate market is fast establishing itself as the place to call home on the North Shore. Here, credibility is affirmed by the fact that the majority of homebuyesr have North Shore roots. And whether they’re downsizing from their current North Shore home or returning to the area after a foray into Greater Vancouver, homeowners at the Lynn Valley Branches Polgyon condos in North Vancouver have one common goal: to claim a palce in a community on the rise. “North Shore people may not fully understand yet what’s happening in Lynn Valley,” explains CNeil, Polygon’s President and CEO. “The Lynn Valley neighbourhood has seen an incredible amount of growth and revitalization with the new Lynn Valley Library and Village. The area is emerging as one of the most popular new North Vancouver real estate neighbourhoods, which I think, to a large extent, the rest of the Lower Mainland has yet to fully grasp.” It is this rejuvenation that has transformed the ensconced Lynn Valley community into a burgeoning diamond in the rough. The whimsical timbered architecture and promenade arens of the new Lynn Valley Library and Village cast an intimate ambience over upscale shopping and services – such as Delany’s Coffee House, the pouplar Babyeats café, and yoga studio – while blending seamlessly with the North Shore real estate market. Encircling Lynn Valley real estate is suhnlight filtering through evergreens, rivers and streams flowing through deep canyons, the peaceful solitude of forest paths, and fresh mountain air. Lynn Valley is a community entirely its own – and Polygon’s Branches condominium presale development of boutique West Coast style condo homes complements this spectacular setting perfectly. Designed by award winning Ray Letkeman Architects, the distinctive buildings at the presale Branches Lynn Valley condo residences artfully embody the established parkland spirit of the North Shore, having been thoughtfully designed around a large landscaped courtyard complete with winding pathways and custom trellies. The striking Pacific Northwest architectural style of the pre-construction North Vancouver Branches condos in Lynn Valley real estate includes details such as heavy timbers paired with brick and extensive glazing, low pitched roofs and extra wide overhangs. Inside the new presale North Vancouver Branches condos and apartment homes, the two and three bedroom pre-construction North Shore Polygon apartment residences are infused with a casual elegance. Spacious, light-filled interiors bring the outdoors in, while materials such as limestone, wood and granite add natural elements to every Branches North Vancouver home. Relax in front of the cozy fireplace, soothe away stress in the luxurious soaker tub, or create mouthwatering meals in the gourmet kitchen fully equipped with smooth granite counters, rich wood cabinetry, and sleek stainless steel appliances that come standard in every pre-construction Branches North Vancouver Lynn Valley real estate residence. On warm summer days, escape to the courtyard gardens of the Lynn Valley Branches condominiums or kick back on your own Branches condo private deck or patio. With the added convenience of a meeting room, onsite fitness facility, and guest suite for out of town visitors, there are plenty of reasons why the pre-sale North Vancouver Branches Lynn Valley condos is a natural choice for any home buyer. A resident manager will also be on hand at the Lynn Valley Branches condominium community in North Vancouver real estate to make the move to this new North Shore community even easier. In addition to being just minutes away from the parkland and wilderness for which North Vancouver is famous, every conceivable urban service and amenity is just minutes away from the new Branches Lynn Valley condo development. Residents at the North Vancouver pre-construction Branches Condos by Polygon Homes have fast access to excellent schools from kindergartens to colleges, community amenities, sport facilities, and for traveling further afield, major transport and commuter routes. “For anyone who enjoys the outdoors, I can’t hink of another residential destination in the Lower Mainland that offers so many lifestyle opportunities,” adds Chrystal. The presale condos at Branches Lynn Valley also offers new homebuyers peace of mind. As a Polygon New Generation Community, the North Shore homes at Branches Lynn Valley condominiums are built for optimum durability and are backed by the Traveler’s Gauarantee Company of Canada warranty program and Polygon’s dedicated customer service team. The Lynn Valley Branches Condo Presentation Centre is open from noon to 6pm daily except Friday and located above Vancity Bank in the new Lynn Valley Library and Village at #217 – 1233 Lynn Valley Road, North Vancouver. Ample underground parking is available. Prices for the Branches North Vancouver condos in the Lynn Valley real estate market start from $439,900 plus GST. For more information, please contact Polygon at 604.988.8489 or visit polyhomes.com. From $889 per month only, you can own a brand new North Vancouver Branches Lynn Valley condo at this incredible price point. This is based on a down payment of 10% and interest rate of 0% for one year term (there and five year terms available at 1.95% and 2.95%) so ask sales staff for details at the Branches Condos on the North Shore real estate market. Take root on the North Shore, for a price that won’t make you reach. With special five year 2.95% financing available for a limited time only, now is the time to act and purchase a new North Shore Branches Lynn Valley condo for sale. At Branches by Polygon, you’re surrounded by abundant forest trails, parks and outdoor retreats – and you’re just moments away from Lynn Valley Village with all the urban conveniences you need. Discover two and three bedroom Lynn Valley Branches apartments for sale total sensibly priced from $389,900. Another great pre-construction North Vancouver condo development is located at Mount Seymour Parkway at the pre-sale Nature's Cove apartments by Harbourview Developments. Recently launched, these two new homes in the North Shore Central Lonsdale community are not going to last very long! Located at 623 West 22nd Street in North Vancouver real estate, these Central Lonsdale new executive family homes are listed at $1,335,000 (asking price). Here is the description: Customs built executive homes, and NO GST!! Central Lonsdale location on a short cul-de-sac in North Vancouver (easy access to freeway). Close to Carson Graham High School and Westview Elementary School. These Central Lonsdale Executive homes designed by Mason Kent will offer 4 bedrooms, 3.5 bathrooms plus a den in addition to a legal 2 bedroom suite downstairs. Features for these North Van Central Lonsdale new homes include extensive use of branite and beautiful chesnut hardwood floors and radiant heating as well. Bonus for these Central Lonsdale real estate homes include a private deck with a view. Close distance to walking trails and a must see! Under Construction – Seymour, North Vancouver real estate. Two new homes by experienced builder. These homes offer 3 levels with legal suite downstairs. Over 3000 sq ft on 33 ft lots and close to schools and amenities. For more information about either of these executive home projects in North Vancouver’s Seymour and Central Lonsdale locations, please contact Amrit at amann@sutton.com or 604.318.3403. Attention Investors and Homeowners – only 4 Townhomes Remaining! First time to the real estate market and conveniently located in the Handsworth catchment area of North Vancouver real estate within walking distance to Edgemont Village and easy accessibility to the Lions Gate Bridge. These North Vancouver three bedroom and two bed plus two and one half back triplex presale homes range in size from 1220 to 1350 square feet of living space. The Edgemont Village Handsworth Townhomes in North Vancouver feature in suites laundry, full appliance package, large outside decks and patios, two parking’s stalls, and storage. Financing available with 4.35% variable and only 5% down. Priced from $429,900 to $499,900 and open Saturday/Sunday from 12 to 5pm at 2917 – 2931 Capilano Road. First time on the North Shore real estate market are the luxurious Cedar Crescent on the Capilano River townhomes. Open Sat and Sun for public viewing between 2-4pm at 2919 and 2931 Capilano Road in North Vancouver real estate, these beautiful North Shore townhomes are now for sale. Beautiful treed grounds with river front common areas, walking distance to Edmont Village and in the top-rate Handsworth school catchment, you can now purchase these Cedar Crescent Townhomes in North Vancouver with a five year financing package at only 4.5%. The two townhouses for sale include: 2919 Capilano Road Townhome which represents a basic unit and is a spacious two bedroom and two bathroom home. With in suite full sized laundry and 2 parking spaces, this 1360 square feet North Vancouver Townhome at Cedar Crescent on the Capilano River also has a 120 square foot covered balcony for outdoor entertainment year round. The maintenance is only $238/month and the price of this Cedar Crescent North Vancouver Townhome is now only $489,900. Mortgage payments are $2261 per month with 5% down! The second new unit at the Capilano River Cedar Crescent townhomes in North Shore real estate market is at 2931 Capilano Road and is a three bedroom and 2.5 bathroom upgraded townhouse. With new hardwood flooring on the main floor a new carpets upstairs and new tile in bathrooms, this practically spotless townhouse unit at Cedar Crescent North Vancouver also has newly painted walls throughout the home. Maintenance payments are $238/month and the asking price is $519,900. Mortgage payments are a lot $2240/month with 5% down. If you would like more information regarding the North Vancouver Cedar Crescent townhomes for sale, please call Brent at 604.617.2224 of Sutton Group West Coast Realty. You Are Invited To the Grand Opening of Addison North Vancouver Condos! Located at 116 Weest 23rd Street, North Vancouver real estate development, the Addison Condos is inviting all valued registrants to chance to preview the new display suite. Starting Saturday, November 14th and Sunday, November 15th from 1 to 4pm, the wait was definitely worth it! The North Vancouver condos for sale at Addison Living are now nearly finished. This boutique style building is quickly becoming one of the finest luxury North Vancouver condo buildings on the North Shore real estate market place. The exceptional quality is second to none. We urge you to shop and compare! One bedroom suites at the new Addison North Vancouver condos start from just $375,000 while two bedroom units start from $450,000. 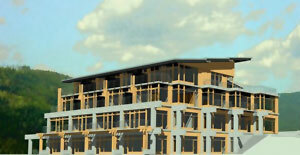 The penthouse suites at Addison North Vancouver condo development starts from $680,000. Don’t miss this opportunity. Please check out all the floor plans and features online at www.addisonliving.com. Alfonso of Sutton West Coast Realty. The design of the new Brook Apartment presale condos is one of pure simplicity and understated style. The North Vancouver Brook condo building nestles on a gently sloping site just below where forests climb toward the peak of Grouse Mountain in the North Shore real estate market. Raw concrete and natural cedar contrast gray framed broad glass window walls. Gracious rooms at the Brook North Vancouver condo residences with over 9 foot high ceilings open onto spacious decks and terraces blurring indoor and outdoor living and maximizing views of Vancouver and beyond. The Brook Apartments in North Vancouver are located at 3707 Delbrook Avenue on the North Shore. The entire pre-construction North Van real estate development will consist of the building of 24 condo units, 4 storey concrete building over 2 levels of underground parking with approximately 24,000 sq ft of residential living space. The offering at the North Vancouver Brook Condos will include one bedroom and den, two and three bedroom units ranging between 800 to 1400 sq ft. The Neighbourhood: The Brook Apartment presale North Vancouver suites are conveniently located near the Westview Centre shops and restaurants,and within a few minutes’ drive to Lonsdale Avenue, Edgemont Village, Grouse Mountain, Park Royal Mall and Capilano Mall. The established residential neighbourhood around the North Vancouver real estate offerings at the Brook Apartments on the North Shore are part of an established residential neighbourhood that is loved by all ages, and holds the appeal of urban living next to nature’s door. Steps from the amenities of the Delbrook recreation centre, community centre, outdoor sports facilitieies and parks. The new North Vancouver condos at The Brook Apartment suites are also next door to the Delbrook Plaza which offer convenience of a number of professional services, businesses and all coffee shops. Green Features at the Brook North Van condos include: Geothermal and Solar Tub technology to heat and cool the Brook Condo building and provide domestic hot water to all residents. Rainwater runoff will be harvested and stored to present excess pressures on the City of North Vancouver sewer system. Fresh air will also be circulated through all condominium unit suites at the Brook North Vancouver new condos and this is a LEED registered development on the North Shore. The Brook Apartments consist of a sixteen unit residential strata real estate development in North Vancouver on a sloping site adjacent to Mosquito Creek. The design references the historical post and beam structures in the neighbourhood using wood and glass cladding inserted into a concrete frame. Garnering much interest from the building industry as well as North Vancouver condo homebuyers, The Brook North Shore is a LEED Platinum certified real estate development and has been recently showcased in the Metro News Vancouver newspaper. According to ‘The Brook goes for the green with style’ article, this presale North Shore condo development is located near Grouse Mountain in North Van real estate market and claims to be the most Built GREEN condo building in all of Canada. These modern and luxurious North Vancouver Brook condos by Streamline Properties Inc has also claimed that the project once complete will gain LEED Platinum certification, the highest rank in building green processes, a distinction that not many residential buildings in Canada can claim. From geothermal technology that provides both heating and cooling to all homes in addition to a solar thermal hot water system and heat recovery ventilization system that constantly circulates air so that it is healthy, clean and filtered, these LEED North Vancouver condos at The Brook North Shore development are a step above the rest when it comes to built green features. In addition to this are low flow plumbing fixtures, and high efficienty appliances, which will save North Vancouver homebuyers a lot of money both short and long term, while making sure that you protect the environment. LEED Platinum certified The Brook North Vancouver condos are built green and also feature reduced consumption of greenhouse gases by about eighty seven per cent, water by up to eighty three per cent in addition to energy consumption down seventy per cent, which is huge when considering the environmental footprint of this North Shore LEED real estate development will be minimal if any. Sustainable North Shore condo living is now available for the first time and the attention to detail in such a new Brook North Vancouver home for sale is unparalleled in this market place. Occupany for the North Shore LEED Platinum Certified Brook Apartments is slated for this Fall, so there are no pre-construction waits and the amazing two bedroom floor plan suites start from just $569,000. Open concept floorplans at the BuiltGREEN North Vancouver condos at The Brook also feature nine foot ceilings, lots of glass windows, concrete flooring and oak cabinetry. Stainless steel appliances and deep soaking tubs are other features in these North Shore LEED Platinum certified apartments at The Brook North Van. For more information, please visit their sales centre now open weekends from 1 to 4pm at 650 Evergreen Place, North Vancouver. Ten of the twenty four LEED North Vancouver condos are sold already. Laying claim to be Canada’s greenest condo development building, The Brook North Shore real estate development is now selling at 650 Delbrook in North Vancouver property market. The Brook condo green features include high efficiency geothermal heating/cooling, solar thermal heating for domestic hot water, heat recovery ventilation units, and water recycling system toilest, landscape irrigation, and bike/car washing – it all adds up to a more than 67 per cent reduction in overall energy requirements at the Brook North Vancouver condos and 83% reduction in water consumption for new home buyers. Designed with modern classic interiors, The North Vancouver Brook condominiums for sale features clean, simple lines with specific details to maximize the use and experience of each new home – polished concrete, rift cut oak cabinetry, extra deep Japanese soaker tub and/or a separate walk-in shower, European tilt and turn windows with integrated window coverings, and a state of the art kitchen featuring Fisher Paykel fridge, dishwasher, and wall oven plus Electroluz induction cook top. The new North Van Brook condo homes for sale is currently being shown by appointment only. To book your private viewing and to get further information about the Brook condominiums in North Vancouver real estate market, please call 604.736.5400 or you can visit on the web at www.streamlinegroup.ca for additional details. For an update on the new MIRA on the Park resale listings or the Lower Lonsdale Re-Sales MIRA Townhomes in North Vancouver real estate, please click on this link. Simple. Modern. Intimate. Welcome to Branches, Polygon’s new collection of apartment residences in North Vancouver’s Lynn Valley. Nestled in a quiet residential enclave, Branches North Vancouver offers excellent access to shopping, community schools, community amenities, transit, and commuter routes. It’s also just minutes from all the parkland and wilderness that the North Shore is famous for – mountain biking trails, skiing, snowboarding, rock climbing, hiking… it’s all at your doorstep. Striking Pacific Northwest design with heavy timbers paried with brick and extensive glazing, low-pitched roofs, and extra-wide overhangs are characteristics of the North Van Branches condo homes. Inside, these two and three bedroom Branches homes feature open living spaces and sophisticated interior design details. Sales are scheduled to commence in 2008. For more information and to priority register, please call 604.871.4125 or visit www.polyhomes.com for details about this new real estate development in North Vancouver called Branches Condominiums. UPDATE on the master-planned Lower Lonsdale Pier waterfront real estate development in North Vancouver including The Premiere at the Pier, The Esplanade & Esplanade West Condos at The Pier, The Landing Live/Work Apartments, Pinnacle Residences and Pinnacle Hotel, Atrium West and Atrium East Presale Waterfront Condos at The Pier. Greetings from Branches, Polygon’s new collection of apartment residences in North Vancouver’s picturesque Lynn Valley. I am excited to report that construction at Branches is now underway and our sales program is scheduled to commence in the fall of 2008 with finished model homes. As a pre-registrant, you will continue to be among the first to receive new information as it becomes available. In the meantime, should you have any questions, please call 604-871-4125 and a Polygon representative will promptly return your call. Greetings from Branches by Polygon, a limited collection of pre-sales apartment residences coming soon to North Vancouver. It is our continued goal to ensure that as a registrant, you are kept up to dtae on the latest real estate pre-construction North Vancouver developments at this exciting new Branches community; as such, I am pleased to inform you that due to high demand, we have decided to move up our sales opening date, with Sales of Branches apartments and pre-sales North Shore condos early this summer! Nested in a quiet residential enclave and showcasing stunning Pacific Northwest Design, the North Vancouver Branches homes artfully embody the established parkland spirit of the North Shore. Inside, these elegant two and three bedroom homes will feature open living spaces and sophisticated interior design details, including smooth granite counteres, rich wood cabinetry and sleek stainless steel appliances in each and every pre-construction North Shore Branches Home by Polygon Homes. And with a premium location just steps away from Lynn Valley shopping, the brand new Lynn Valley library, and the serene wilderness for which North Vancouver real estate is famous, Polygon’s Branches apartment condos presales is the ideal place to call home on the North shore. We will continue to keep you informed as the sales opening for Branches North Vancouver condo homes approaches. In the meantime, should you have any questions, please do not hesitate to contact me at my direct line, 604.871.4145, or send me an email at branches@polyhomes.com. Polygon Branches Development Ltd. | Polygon Whitetley Court Development Ltd. Shawna Lane – Corporate Sales Coordinator. In terms of pricing, the estimates for the Branches condos in North Shore one bedroom new condominium residences are from the low-to-mid $300,000s, with pricing then obviously increasing at you look at homes with more square footage. Our one bedroom homes are going to be just under 700 square feet; our new North Shore condos at Branches two bedroom homes are going to range somewhere between 900 - 1,100 square feet; and our three bedroom homes are also going to be around 1,100 square feet. Simple, modern, and intimate, Branches Lynn Valley condos is Polygon Homes’ new collection of preconstruction North Vancouver apartment residences on the North Shore. Nestled in a quiet residential enclave, North Vancouver Branches apartments by Polygon offers excellent access to shoping, schools, community amenities, transit and commuter routes. It’s also just minutes from all outdoor recreational opportunities on the North Shore real estate market – mountain biking, trails, skiing, snowboarding, rock climbing, hiking and so much more. The Polygon North Shore Branches apartment condo Lynn Valley pre-sales features a striking Pacific Northwest design – heavy timbers paried with brick and extensive glazing, low pitched roofs, and extra wide overhangs –t hese two and three bedroom condo homes at Branches North Vancouver are designed with open livig spaces, smooth granite coutners, rich wood cabinetry and sleek stainless steel appliances. The sales program for the pre-construction North Vancouver conods at Branches Lynn Valley real estate is scheduled to commence this summer. 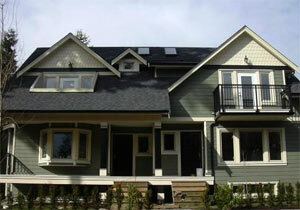 For more information, please call 604.871.4125 or visit www.polyhomes.ca. Just weeks ago, Polygon Homes launched its newest collection or pre-sales apartments residences with the opening of Branches on the North Shore. Eager homebuyers snapped up 60% of the first residential building in just two days demonstrating that today’s home buyers are still attracted to communities with great location, well designed homes and distinctive architecture The Branches Lynn Valley presentation centre is open from noon to 6pm daliy except Friday and located above Vancity in the new Lynn Valley Library and Town Centre at #217 – 1233 Lynn Valley Road, North Vancouver. Ample underground parking is available. Priced from $439,900. For more information about the Lynn Valley Branches Polygon condo homes, please call 604.988.8499 or visit polyhomes.com. A formula for the ideal lifestyle: Start with the perfect location, just steps from Central Lonsdale’s urban amenities, yet surrounded by parks and nature trails. A site at Upper Lonsdale Addison North Vancouver real estate properties, rich in history, where an architectural legacy has been lovingly restored. Create a modern masterpiece of living at the Addison Condo Townhomes in North Van’s Upper Lonsdale community, with contemporary design details and exceptional quality. Original character. Mountain views. Green building principles. It all adds up to the ultimate home at Addison Living in Upper Lonsdale, North Shore real estate. For more information and to help us serve you better, please complete the form below or call us at 604.889.7034. All information will be kept private and confidential. For more information about the upcoming new Upper Lonsdale character homes at Addison North Vancouver townhomes and condos, please visit www.addisonliving.com. There are only 29 character homes available in the Upper Lonsdale property development and it will redefine a modern classic. More information about the sought after Addison Living apartment complex on West 23rd and Lonsdale AVenue in Central Lonsdale real estate. The pre-sales Addison real estate development consists of the construction of an apartment complex complete with a restoration of a heritage home facade for five of the twenty nine pre-construction condo units. From one bed and one bath units priced in the mid $300,000s to penthouse two bedroom plus den and two bath presales suites at Addison that range to only $550,000 or so. This is a great buy for any one interested in the Central Lonsdale Addison condo development in North Vancouver real estate market. The heritage home at Addison is 3 floors while the rest of the apartment building at ADdison Central Lonsdale is four stories. The residential builder for Addison Living North Shore is Newport Consultants Ltd. and all presales homes come with a 2-5-10 Home Warranty from Travelers Guarantee. Located at 116 West 23rd Street in Central Lonsdale North Vancouver real estate market, the Addison cityhomes and apartment residences are redefining a heritage home into a modern classic residence featuring a luxury collection of only twenty nine homes. The one bedroom pre-construction North Vancouver apartment condominiums at Addison Living are featured from just $356,000 and you still have time to customize your home during the pre-sales phase of the project. 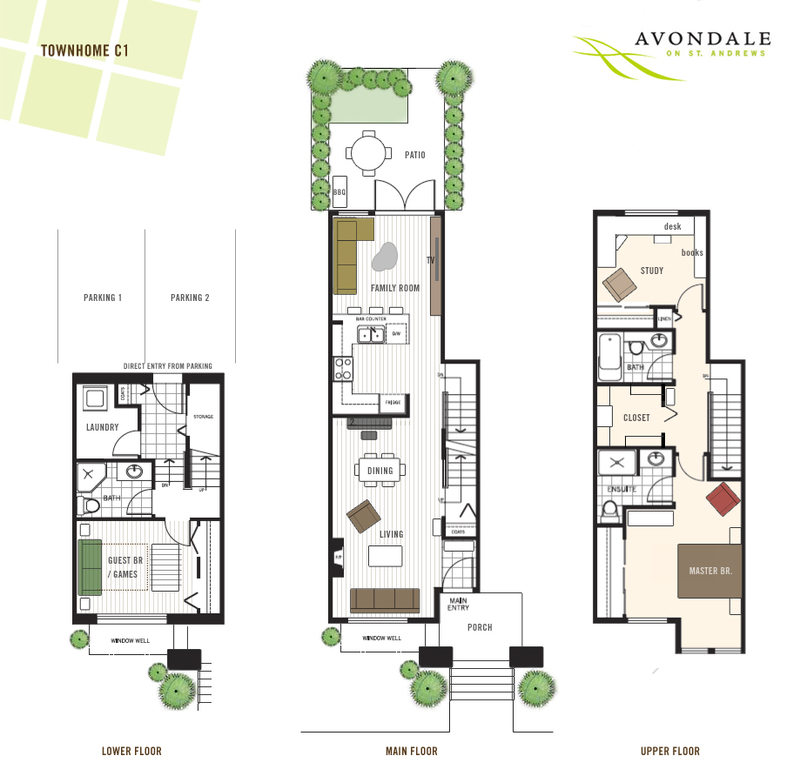 The Addison Central Lonsdale apartments! One of the North Shore’s newest and most beautifully designed West Coast luxury apartment building in North Vancouver real estate market. With its distinctive exterior and warm and welcoming interiors, this 29 unit pre-construction North Vancouver condo complex offers exceptional European Craftsmanship with a variety of sensational floor plans. Set in a vibrant community of central Lonsdale real estate and the beauty of the North Shore Mountains, as your backdrop, you are just steps away from coffee shops, restaurants, recreational facilities, banks and North Shore parks. As a homeowner and resident at the presale North Vancouver Addison apartment condos in Central Lonsdale, you’ll enjoy the contemporary energy efficient stainless steel appliances. Feel at home at Addison Living condominiums with spa like bathrooms, nine foot ceilings and fully secured underground parking. In addition, residents at the pre-construction Central Lonsdale North Vancouver Addison apartment condominiums will enjoy high efficient EnergyStar vinyl windows to name a few of the Addison’s many features. Contact Alfonso of Jon of Sutton West Coast Realty at 604.986.9321. Ideally located less than a block from North Vancouver’s Centennial Theatre and just steps from Central Lonsdale real estate’s vibrant restaurants, gourmet shops, and eclectic boutiques, Addison North Vancouver condos for sale is a collection of twenty nine character homes that include five heritage residences. Classic stone and beam come together in a clean, modern, environmentally aware design giving respect to the past and thought for the future along the vibrant Central Lonsdale North Shore community. All this plus mountain views and outstanding attention to detail from a small builder for the pre-sale North Vancouver Addison condominium residences. 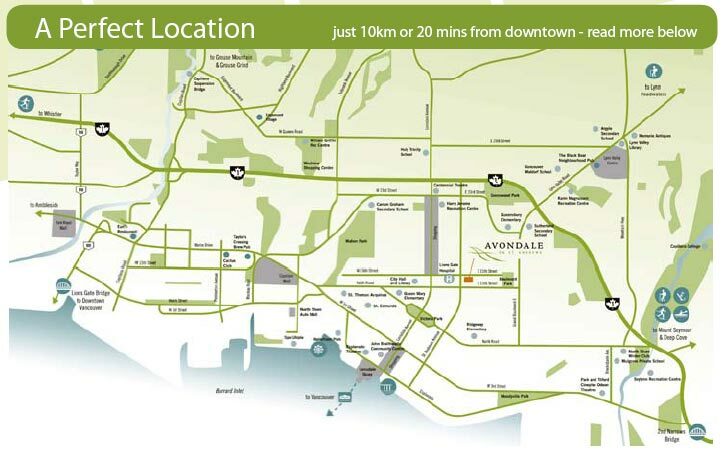 For more information about Addison Living on the North Shore, please call 604.889.7034 or you can visit www.addisonliving.com anytime for more details. The Evoc condo homes in North Vancouver will be completed by summer of 2009. The Evoc condominiums will take the place of a mixed-use building currently there and will feature condominium homes that feature balconies both at the front and back of the residential complex in addition to two sided balconies for corner condos. Evoc North Shore condos will also set aside fifteen parking stalls underground for commercial use and seventeen surface stalls for the businesses that will be created on the ground level of this new North Vancouver real estate project. The residential parking side will include 45 stalls that will equal to about two parking spots per condo home, something that is quite rare in new presales North Van developments these days. The Evoc condominiums will have a lane in the back that is open on each end ant he exterior of the EVOC condos will have exterior lighting with low impact, high efficiency lighting fixtures. Although the Harbourview Project has a flat roof, it will withstand torrential rains and snow and the residential building at EVOC condos North Vancouver will also be energy efficient with Eco Density as a primary target. Easy access to public transport, shopping, groceries, bike routes and parks will provide a green living experience. The structural and finishing aspects of the condos at Evoc will include an improved envelope efficency for decreased heat loss, central high efficiency hot water boiler, natural gas fireplaces, energy star appliances, energy efficient light fixtures and parksade sensors to reduce the energy that is used in addition to Low ‘E’ equivalent glazing for reducing heat-gain. In addition, the fourth floor penthouse condo residences will have skylights. For water efficienty at Evoc condominiums, there is going to be a drought tolerant landscaping, low flow faucets and showerhead fixtures, dual flush, low consumption toilets, storm water detention tank and permeable pavers for natural site penetration. The EVOC North Shore real estate project will have a development time of eighteen months and will not have any community or communal areas which will also decrease the strata fees. The North Vancouver presales real estate EVOC condo homes are expected to start in the spring of 2008 with a targeted completion around summer of 2009. For more information about North Shore’s EVOC condo boutique residences, please email HarbourView Projects at info@harbourviewprojects.ca. Another North Vancouver property project by HarbourView is the Maplewood Landing development that is actually a fourteen strata title office and warehouse project with floor space from twelve hundred and eighty five square feet. The Maplewood Landing North Shore commercial and business centre will be located at 2411 Dollarton Highway in North Vancouver closer to the Ravenwoods and Deep Cove area east of Second Narrows Bridge. The expected completion of Maplewood Landing is for the summer of 2008. The new Gateway Condos in North Vancouver is the destination for North Shore Living. Just across the street from Capilano Mall and numerous other shopping, dining and entertainment venues, the Marine Drive Gateway pre-construction condos in the North Vancouver real estate market are coming soon. The physical location of the North Van Gateway condos is at 935 West 16th Street on the North Shore BC. For more information, you can call 604.889.4551 or email info@gatewayonmarine.com. The official website for the Gateway Condos in pre-construction North Shore real estate is at www.gatewayonmarine.com. In many ways, this new North Vancouver condo development is in the heart of the North Shore. Whether you like to live, play and/or work, there is something for everyone here with contemporary condominiums and the most modern convenciences that you will ever encounter. In terms of the pre-construction North Vancouver Gateway condos, here are some features of the residences: offering two bedroom plus den and two bathroom residences, there will be seven contemporary and open plan floor layouts at the Gateway North Vancouver condos in addition to having clean lines, contemporary style and natural lighting form large oversized windows. In addition, these new North Vancouver condos at Gateway on Marine will have hardwood floors, recessed lighting, gas fireplaces and in suite laundry for all purchasers in addition to private walk out balconies on select floor plans. Other features of the Gateway on Marine pre-sales North Shore condos include an intercom front door security system, high speed pre-wriing, security cameras and dual pane windows to reduce noise transfer. Gateway North Shore – Over 65% Sold Out! Large patios and great views still available at the North Vancouver Gateway North Shore condos for sale. Representing the North Shore real estate’s best location and best finishings, the Gateway condos are now sixty five per cent sold out! And best of all, there are two bedroom plus den floor plans that start from an incredible price of just $374,900. What many homebuyers don’t know is that the Stanley Park trees that had fallen in previous wind storms in downtown Vancouver have now been utilized to their fullest by the Calgary developer at Gateway North Shore condos now selling. Featuring a boutique development of only 21 residences in North Vancouver real estate market, Gateway North Shore condominiums are priced from $375,900 to $489,900 and are located at 935 West 16th Ave in North Van. In addition, these North Shore Gateway condos are between 777 and 940 square feet and are developed by Triman Developments Ltd. Occupancy is slated for October 2009, so move-ins are very soon. The Gateway North Shore condos are designed by Bumen Architecture and the custom interiors are by Pebble Creek Custom Design. From the gail force winds back in 2006, over one thousand trees were blown over by the high winds in Stanley Park. Now, here at North Shore Gateway condos for sale, these old growth timber woods have been used in the construction of these high-quality North Vancouver homes for sale. North Shore Gateway Apartments Grand Opening Sales on August 8th! Homes up to two bedroom and den from just $374,900 will be available for the grand opening on August 8, 2009! Exclusive floorplans and pricing for the pre-sale Gateway North Shore apartment condos are now available online, so register today at www.gatewayliving.ca. Luxurious North Shore living is now available at 935 W 16th Street, North Vancouver real estate market, so call 604.984.7333 to get onto the priority list today. Standard features of the Gateway North Shore apartments for sale include Caesarstone coutnertops, undermount sinks and spa inspired bathrooms. Other features at these pre-sale North Vancouver Gateway North Shore condos for sale include gas fireplaces, engineered hardwood floors, designer fixtures and stainless steel appliance package. Experience true North Shore condo living here at Gateway Apartments at West 16th and Marine Drive, just opposite of the Capilano Mall and future retail/business park. Cutting edge and modern, these pre-sale North Shore apartments for sale have a historic charm about them, with a triangular building architecture that is both striking and sophisticated. The Gateway North Shore apartments for sale in North Vancouver real estate market are very exclusive and feature a number of functional floor plans that include very unique two bedroom plus den layouts. With attention to detail and the smallest finishing detail that most developers forget about integrating, the North Van Gateway condos for sale will include motion sensors for vanity lighting in addition to roller blinds on all windows for privacy. In addition, other thoughtful finishes at the pre-sale North Shore Gateway apartments for sale will include soap and accessory niche in the shower fwalls in addition to duotone kitchen millwork with high gloss white upper cabinetry and darker lower cabinets, fireplaces with art niches above them and solariums in most of the North Vancouver apartments for sale here at the Marine Drive Gateway real estate development. The top floor fo the turret features a comfortable and truly functional space in addition to great views and high ceilings. Close to hiking, biking, water sports and mountain resorts, the North Shore Gateway condos areclose to everything you need to get to including the Lion’s Gate Bridge, waterfront, Lonsdale Quay, the coastal mountains and the West Vancouver seawall as well. The grand opening for the Gateway North Shore condos for sale is happening August 8th. All homes at the Gateway Condos on Marine Drive in North Vancouver will have individually controlled heating and some residences will have city views too. The gourmet kitchens at the Marine Drive Gateway pre-construction North Shore condos will have rich chocolate brown custom cabinetry, island and eating bar in select layouts, superior stainless steel appliance package, granite, stinaless steel sink and ceramic tiling. The bedrooms at the North Vancouver Marine Drive real estate development will have spacious rooms, private balconies in some levels and floorplans, and elegant high grade carpeting while the spa inspired bathrooms will have designer finishes, glass shower doors, tile surround, soaker tub and slider shower head that are quite unique and imipressive. The National Home Warranty will be present for all home buyers of these pre-construction condos at Gateway on Marine in North Vancouver and there will be private secured covered parking or underground parking in addition to storage lockers and a bike storage area for residents at this North Shore condo development. On the north east corner of Marine Drive and Hamilton Avenue, the Gateway on Marine condo homes in North Vancouver puts you just minutes from Lions Gate Bridge, Stanley Park, the local mountains and downtown. The seven floor plans for the new Gateway on Marine condominium residences are located on their web site at http://www.gatewayonmarine.com/floorplan.html. For any retail inquires at the North Shore Gateway on Marine development, pleae refer to this PDF document online at http://www.gatewayonmarine.com/PDF/leasing.pdf. For condo sales and other pertinent information surrounding the new pre-construction North Vancouver Gateway condos on Marine, please call Azeem of the Sutton Group at 604.889.4551. Also, please register on line for up to date information about the new Gateway on Marine condo homes on the North Shore real estate market. The Gateway North Shore Living is Now Selling! New construction residential North Vancouver condo suites at The Gateway Capilano Mall is now selling with two bedrooms and two bathroom bonus room floor plans starting from an incredible $425,000. Open Saturday and Sunday from noon to 4pm on 935 West 16th Street, North Vancouver across from Capilano Mall, the Gateway North Vancouver condo apartments fro sale are by Triman Developments Ltd.
Gateway North Shore Condos Now Launching! The waiting is finally over! Register now and get VIP priority service for the new North Shore Gateway Condos near Capilano Mall. Pre-sale Gateway North Shore homes for sale up to two bedrooms and den are now available. The floor plans for these new North Shore condos range from seven hundred and seventy seven square feet all the way to nine hundred and forty square feet in size. With exclusive floor plans and finishings, these represent the best value on the North Shore real estate market at this time. 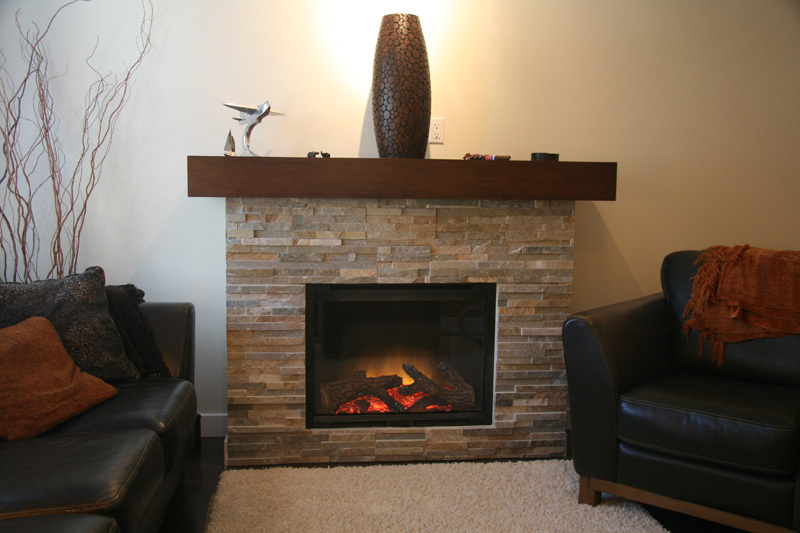 Standard features here at the Gateway North Shore condominium suites include cesare stone countertops, fireplace, laminated hardwood flooring and designer fixtures. Other standards at the North Shore Gateway condos for sale include impressive appliance packages with under mounted sinks and spa inspired bathrooms and much much more! The presentation centre for the new North Shore Gateway condos near Capilano Mall are opening very soon, so register today! The site address for this new North Shore real estate development is located at 935 West 16th Street in Nroth Vancouver. Call today at 604.984.7333 or visit their condo marketing site at www.gatewayliving.ca. Marketed by D’Ovidio Associates Marekting. Located at 272 West 4th Street, North Vancouver, BC, Sotheby’s International Realty is marketing one of the most sought after pre-construction townhome developments on the North Shore real estate market. Enjoy rooftop terraces with panoramic harbour views, set up for natural gas and bar sink. 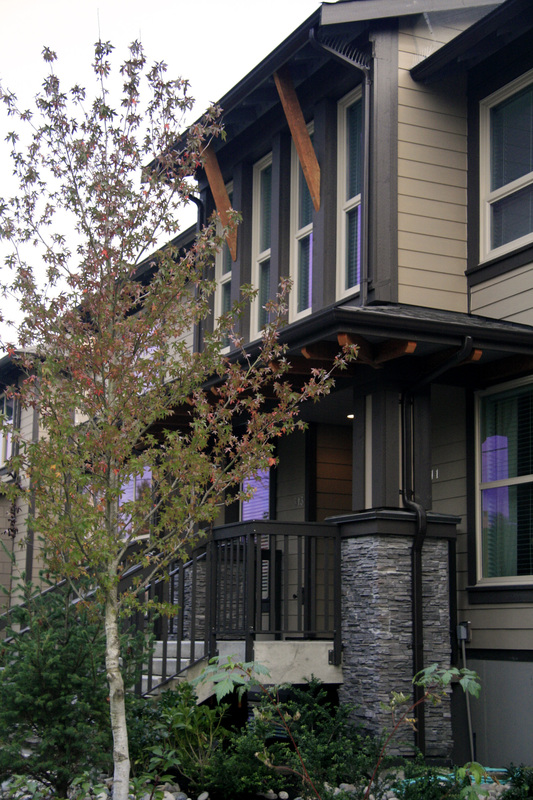 The North Van Terraces on 4th Street townhomes feature large decks off master suite plus media room and loft. The luxury homes built for you at the Terraces on 4th North Vancouver real estate feature two sets of washer/dryers per unit, granite countertops and hardwood floors. Underground parkade with heated driveways are other fabulous features of the Terraces on 4th townhomes in North Shore. Only 4 townhouse units are available and visit Terraceson4th.com for more information regarding these new North Vancouver townhomes for sale. Contact Dave or Ali at 604.808.5221 or 778.839.5583 for details. Just steps from Lonsdale Quay and the North Vancouver waterfront, the new townhomes at Terraces on 4th St, North Vancouver feature a prime location also close to Grouse Mountain, downtown Vancouver and much more. Relax and have a glass of wine or cook up a BBQ with friends and family on your rooftop terrace at the Terraces on 4th townhouses on the North Shore that present unobstructed city views and water panoramas. Located on 4th Avenue between Mahon and Chesterfield in North Vancouver, the new Terraces on 4th townhomes are luxury homes for discerning home buyers. With only four available new townhouse units for sale, you will be just stseps from all of Lower Lonsdale’s amenities including grocery, shopping, dining, cinemas, banks, transportation and the SeaBus. Offering 360 degree views of downtown Vancouver, Lions Gate Bridge and the North Shore mountains in addition to amazing sunsets, each of the new townhomes at North Vancouver’s Terraces on 4th Street town houses will have three bedrooms and three baths. The entire North Shore real estate development will have only 4 units that vary from 1530 to 1730 square feet in size. There will also be a beautifully landscaped courtyard that will be common space for residents in each of the four townhomes. A unique development can now be yours. For more information, you can find the floor plans of the Terraces on 4th Townhomes in North Vancouver online at http://www.terraceson4th.com/Floorplans.ubr. Each layout is three floors plus a large roof top deck. Townhome Units A1 and A2 have a lower floor guest suite with separate entrance, large one bedroom suite, bathroom and storage while the North Shore Terraces on 4th Lower Lonsdale townhome Units B1 and B2 have a loft style room on the top floor which leads to the rooftop deck. 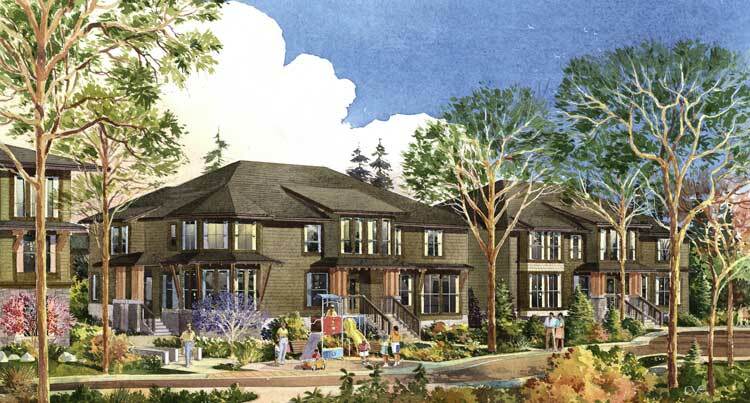 With a severe shortage of townhomes and apartment homes in North Vancouver, these new Lynn Valley townhomes in the heart of this cute, safe and friendly neighbourhood will introduce seven pre-sales townhouses in the centre of it all in Lynn Valley North Vancouver. Priced between seven hundred and forty five thousand to seven hundred and ninety nine thousand dollars (which does not include GST), these Lynn Valley presales townhomes in North Van are very well priced for this location. There are no other new town homes in the area, so these three level, three bedroom homes are going to get a big draw from growing families and retired couples alike. In addition, the EagleLynn townhomes at Lynn Valley will be approximately one thousand seven hundred and fifty all the way to nineteen hundred and fifty square feet. Call for details: Robert Prem at 604.841.7465. Priced between the mid to high seven hundred thousand dollar range (plus GST), the EagleLynn townomes in Lynn Valley in the heart of this beautiful community Is marketed by Robert Prem at Macdonald Realty. With a great location close to clinics, schools, parks, open green spaces, shopping and the Lynn Valley Centre, the seven townhouses in Lynn Valley North Vancouver real estate also have full basements that are finished and patios and yards too that are very unique to this style of development. The 7 townhomes had their open house on Saturday, March 22nd between 2 and 4 but you can book an appointment for townhome previewing at EagleLynn Lynn Valley today. High ceilings and iron railings are built with both designer quality and style and are definitely luxurious homes in the heart of Lynn Valley North Van. Contributer Maria for the North Shore Outlook explains. Knightsbridge Properties has submitted an application to the City of North Van to develop a four-star Hilton Hotel at the southeast corner of Harbourside Drive and Fell Avenue. The proposed hotel would house 215 hotel rooms, a 17,000 square foot conference centre, 15 retail units, as well as three food and beverage facilities. And unlike other real estate North Vancouver sites along the Burrard Inlet in the Harbourside Business Park, this particular piece of North Shore land extends right to the water’s edge. The real estate developers are also proposing to put a public dock along the shoreline which would facilitate the startup of a water taxi service between the North Vancouver Harbourside waterfront and downtown Vancouver. However, the North Shore reale state developers will have to overcome a few hurdles, which primarily involve height restrictions before their application can be approved. The proposed height of the hotel in North Vancouver would vary between one storey on the northwest and northeast portions of the building where the lounge and retail space would be, to two, four and eight storeys for the hotel’s accommodation area. According to the North Vancouver real estate development plans, at its tallest height, the Harbourside Hotel would stand 102 feet – or double the size of the maximum allowable height of 50 feet that the site is currently zoned for. Knightsbridge Properties, which has built the North Van Holiday Inn eight years ago, has advised the City of North Vancouver that the proposal for the site is only viable if that extra height is available as a lower building design would result in a much smaller hotel. In a report presented to City Council planning real estate North Shore staff said they support the processing of the application for a number of reasons including the importance of the Harbourside Business Park to be seen as a destination and attract more than just office park users. While North Vancouver City staff did admit the requested variance to the height from 50 feet to 102 feet would have some impact on views, they suggested that because buildings within the Harbourside Business Park were not developed as view properties they would be equally impacted if a new building was built within the 50 feet restriction. Other areas that coule potentially impacted by the height of the current Harbourside hotel in North Vancouver concept fo the hotel include Hamilton, Fell and Bewicke, and to some extent, Lower Lonsdale on the North Shore. Now that City Council has agreed to consider a zoning variance for the North Vancouver proposed Harbourside Hotel by the Knightsbridge Properties, the applicant will develop a more detailed design which will be presented to the planning staff sometime next month. According to the North Shore News, the City of North Vancouver is exploring options for the densification and zoning of the future of the Lonsdale corridor. J. Weldon writes: The City of North Vancouver is looking to its citizens to help shape the future of its urban core with the launch thisw eek of the second open house phase of the Central Lonsdale Planning Study. The municipality held open houses on the topic Tuesday and Wednesday to go over some of the objectives and options being considered. Now, it is inviting residents to put in their two cents. Until the end of May, information boards will be on display at Harry Jerome recreation complex. Visitors are invited to give input on a variety of topcs that will fundamentally affect the North Vancouver real estate’s development in the coming years. Council launched the planning study in June last year. The project’s objective was to come up with a sustainable long-term plan for the neighbourhood, defined as the area bound by the Upper Levels Highway in the north, Eighth Street in the south, Chesterfield Avenue in the west and St. George’s Avenue on the east. The City of North Vancouver’s study three main goals are to maintain and raise the number of rental units in the area, to make the town centre more livable and walkable, and to improve its sense of place.